We're excited to present the latest edition of the Pretty Little Liars Round Table. Gathered below, our panel is here to pick apart "Someone to Watch Over Me," as this ABC Family hit builds toward its first season finale. Teresa: My favorite scene was definitely Hanna smacking Jenna's glasses right off her face. Kate: The Slap, enough said. I'm so glad the girls and Toby are standing up to Jenna's bullying, and I'm so excited to see where this plot line takes us. Can Jenna really know about anything more than the garage fire incident? What is she hiding??? Tara: The sweetest scene was when Toby told Spencer to bring coffee to the policemen who were watching her. I think the girls really have the best chance to solve the A mystery and Alison's murder when they pool their resources with strong, smart men like Toby and Caleb. 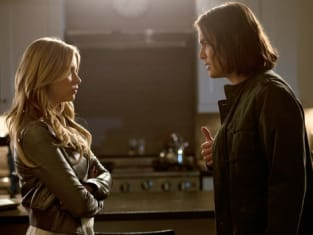 Is this it for Caleb and Hanna? Will she forgive him? Teresa: I don't think Caleb and Hanna have much a chance... unless he saves her from one of A's nefarious plans. Kate: Well, first, Caleb's priority should be changing his locker code. Second, Caleb should prove his love to Hanna by getting some dirt on Jenna that will open up a whole new set of clues for the girls. But if he can't do those things, I hope Lucas comes back into the picture. Where has he been? Tara: It's over. Bring back Lucas! Was Aria careful enough in hiding her Ezra mementos? Teresa: The Ezra-tokens will definitely be found in a police search of Emily's locker. Kate: As the talented Teresa Lopez pointed out in her recap, why did Aria think that hiding her stuff in Emily's locker was somehow more secure than keeping it in her room? If the police are going to get search warrants for Aria, they're obviously going to get warrants for Hanna and Emily, too, and will check Emily's locker. Also, Aria, a spoon doesn't have to be hidden, just wipe it off for fingerprints and keep it in your desk drawer or something - no one could ever trace that back to an illicit affair. Meanwhile, the book with a named inscription DEFINITELY needs to be hidden! What are you thinking, Aria? You're never going to figure out who A is with those sleuthing skills, girl! Tara: Were these hidden in Emily's school locker, or her swim locker? If it's her swim locker, I guess there's less of a chance of the police finding it... but there's more of a chance of Paige somehow stumbling upon it, which may be just as bad. How is Spencer going to explain the fibers in her bracelet and get out of this? Teresa: I think Spencer won't be able to explain them, but some better evidence (like maybe a bloody glove?) against someone else will get her off the hook. Kate: This is a tough one. For starters, good call on deleting stuff off your computer and not running away when Ian tells you to. I would also suggest wearing a wire whenever you're around Ian. Maybe slip in the fact to the police that Ian spent the whole summer doing drugs... that way, they can drug test him and, even if it won't help the case, it will at least get him fired from the high school and smear his name a bit, right? Tara: Things are going downhill for Spencer - how long until the police trace her back to the bracelet maker and see that her name is on the receipt as the one who purchased it?